The wheelchair and chair cushion are a team, working together to provide mobility and comfort. They each complement each other and offer the user safe and relaxing support. No other wheelchair cushion does this like the Jay 2 Wheelchair Cushion available here on PHC. Its lightweight and low-maintenance structure make it perfect for those seeking a comfortable, hassle-free solution. 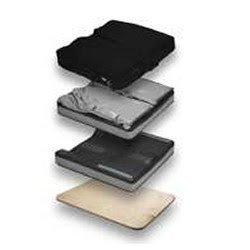 A good wheelchair cushion provides exceptional comfort, pressure management, upright positioning, increased sitting stability and reduced fatigue. The Jay 2 wheelchair back does just this with its exceptional gel component. A gel wheelchair cushion conforms to the appropriate pressure points on the buttocks and legs, which provides an even distribution of upward support. They are specifically designed to relieve pressure in certain areas by absorbing it into the gel packs. It’s not only incredibly important to sit correctly in a wheelchair, but users should also be comfortable when they do so. The Jay 2 does just that. This incredible cushion comes with many amazing benefits. It is fantastic for users who frequently move themselves in the wheelchair. The mobility of the gel allows for quick adaptability between movements. With more than two inches of Jay Flow fluid contained in the cushion, it conforms to bony areas and provides maximum pressure distribution and reduction. This cushion is also designed for users who have a high risk of skin breakdown. If there is an area of skin that is broken down or on the verge of being harmed, the relief of pressure from the gel can reduce the chances of further damage. Furthermore, the Jay 2 is easily customizable, able to accommodate any specific needs the user may have. With a variety of secondary supports, the cushion can address both fixed and reducible orthopedic deformities. Finally, to prevent bottoming out after long-term use, there is a firm foam base beneath the gel. This base is contoured to provide the best pelvic positioning possible, which helps the user with posture and energy levels. The Jay 2 Wheelchair Cushion is durable, comfortable, adaptable and built to last. It’s a popular product among our customers, and we are proud to offer it at an incredible price. Having an appropriate seat cushion in your wheelchair is essential to remaining upright and relaxed. Without a good cushion, the user can become fatigued, achy, develop severe pains and even wiggle out of place. Stay away from useless wheelchair cushions. Use the Jay 2 Wheelchair cushion for optimal support and comfort.